Patients come to Richardson Podiatry Associates for an assortment of medical issues that need treatment. Heel pain, sports injuries, and diabetic foot concerns are problems for many people. 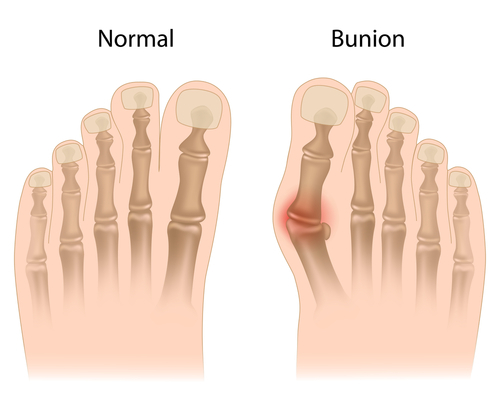 We also have a lot of patients who come in to see us with bunions that cause pain, discomfort, and impaired ability to perform normal activities. Our goal is to provide relief through the use of conservative treatment methods, but sometimes bunion surgery is necessary. You may think this toe deformity only happens to older individuals or is only caused by women’s footwear. However, the condition is actually quite common, even for younger individuals. It is estimated that around 25% of people aged 18-65 have developed one (with that percentage jumping up to 32% for those over the age of 65). It occurs when the tissue or bone around your big toe has become deformed. The big toe will point in toward the little toes, and the first metatarsal bone will angle out away from your foot. The lump seen on the inside edge of the foot is the metatarsophalangeal (MTP) joint sticking out. The MTP joint is where the toe connects to the foot. Placing an uneven amount of pressure on the foot, and especially the MTP joint, is what ultimately causes the deformity to develop. This could be an irregular step from wearing shoes that are too tight, having a condition like arthritis, previously injuring a foot, excessively pronating while walking, and, yes, wearing high heels. Foot type is also passed down from parents, which makes some patients more prone to developing bunions when the conditions are just right. The most visible symptom is the bump that starts to protrude near the big toe, which could change the shape of an entire foot. There may be a lot of pain and swelling from this bony protrusion and, over time, the skin may become sore and callused in the area where it rubs against the inside of a shoe. We will always recommend conservative treatment before considering the use of surgical procedures. That is because surgical treatment may limit mobility and keep a patient from performing favorite activities. Thus, surgery candidates are often only elected based on the severity of pain and the impaired mobility caused by the misaligned joint. The only way to truly correct a bunion is through the use of a surgical procedure. This means that if conservative care is not providing desired results, surgery is the only hope for relieving severe pain or mobility issues. Many candidates for surgery experience difficulty even wearing roomy shoes or using orthotic devices that should provide comfort. A mild problem may require removal of the deformed part of the bone and a readjustment of the muscles and tendons in the surrounding area. For moderate cases, the bone is cut and moved back into place with a repositioning of the ligaments and tendons. In severe cases, the bone is cut and the deformity is removed, followed by a rearrangement. When a patient also has arthritis, an artificial joint might take the place of the original one. During the healing process, there may be numbness, swelling, and stiffness. As with any surgical procedure, there is a risk for infection (even though the procedure is performed in a sterile environment). It is important to note that it is possible that the deformity could return or nerve damage and discomfort may be present, but we take measures to reduce the odds of these things happening. Once the condition has developed, it will continue to worsen if action is not taken. The only way to truly correct the deformity is with surgery, but we are committed to exhausting every alternative before reaching that point. Visit Richardson Podiatry Associates and find the expert bunion care you need! Call our Richardson, TX foot doctor office at (972) 690-5374 or make an appointment request online.